This weekend was spent mostly in the company of fiber people. On Saturday I went to an all-day spin-in at the Weaving Works that takes place twice a year. 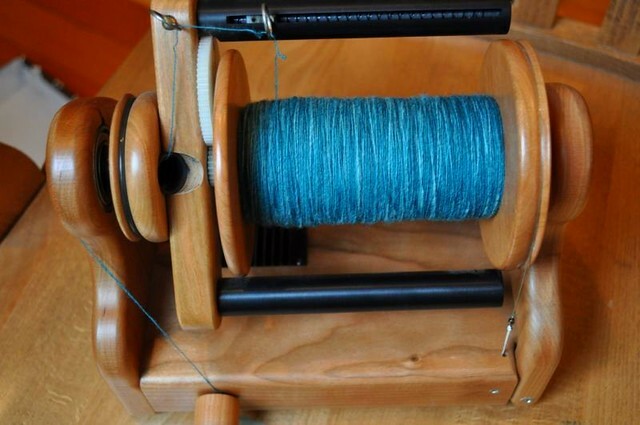 I fielded a lot of questions on my miniSpinner and spent the day spinning my blue Corriedale. I was chided by a few serious spinners there for not spending more time on it. I had been spending a decent amount of time spinning at home when I first got the miniSpinner but when we got George I put it away because I was sure he would get caught up in the power cord and pull it off the table. My laptop has had several similar near-death experiences during George's enthusiastic romps around the house. But the upshot is I should spin more because I love it. On Sunday, the Fiber Gallery kicked off its first-ever knitalong. We are knitting Katarina together. We had an amazing turnout for the party. So many energetic knitters all ready to cast on. I'm ready to join the sleeves to the body of the red raglan I'm making for my younger son and I've knit Metro nearly to the armholes. I'm trying to not cast on yet for my next shawl until I finish the raglan. So much fiber, so little time! That's a gorgeous color on the spindle. How about more pix of George and Bella?